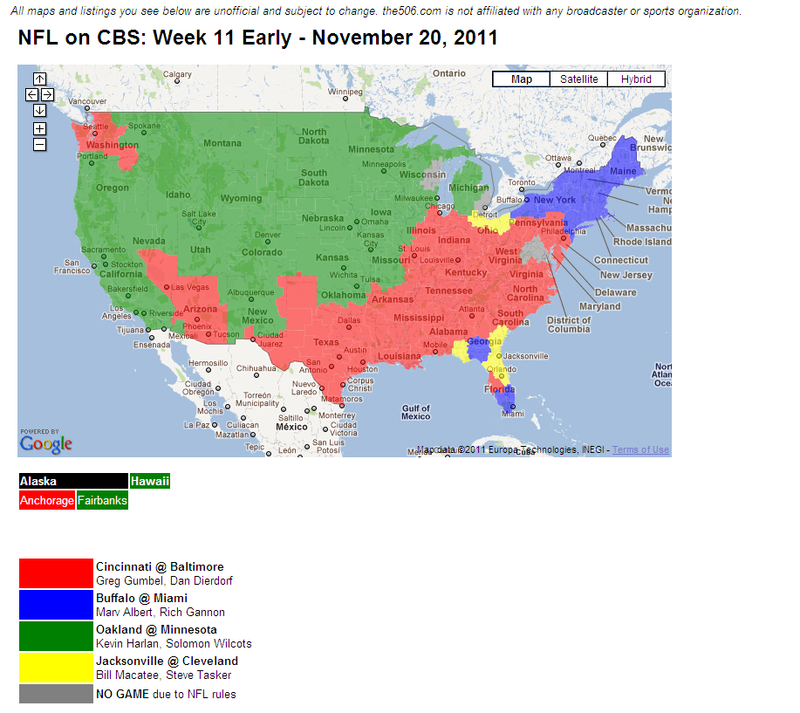 How NFL broadcasts are shown (or not shown) across the country is a puzzle every week. Blackout rules, doubleheader rules, other ridiculous rules make it pretty much a mystery. For instance, if the Browns have a sold out home game (on CBS in this instance), and the other network (say, Fox), is scheduled to have a doubleheader, they are not permitted to air a game opposite the Browns game, leading the local affiliate to run exciting episodes of 'Taxi' or 'American Idol Auditions'. Well, for the past few years I've been living in Chicago, and with the lack of national television games for the Brownies, I'm normally at the Red Ivy Chitown Dawg Pound in Wrigleyville every Thursday, Sunday afternoon or night, or Monday night.. Definitely the best place to watch the games, but what about when I'm traveling? Does the NFL publish where their games are going to be shown? Apparently not, because the only place to find out what games are where, for the past umpteen number of years, is on a great sports TV resource blog called The 506. Great resource to check if you're ever curious on what's going to be on tv, not only in the NFL, but in all major sports. Well due to 1% geography, and 99% to the predicted crappiness of the product, only about 3.8% of the United States is going to be subject to Steve Tasker and Bill Macatee and the Jaguars-Browns this Sunday. But if the Browns continue their ways, you could switch over to golf, soccer, or an old episode of Seinfeld.